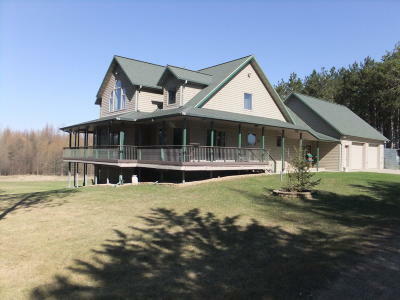 Approx 27 acre in quiet area close to Menominee!! Quality built 4200 sq ft home w/metal studs & ICF foundation w/permanent forms. Super high efficient construction. Large living room. Large kitchen/dinette w/ceramic flooring. 1st floor MBR w/full bath, whirlpool tub & walk-in closet. Lower level Family Room & huge entertainment room w/walk-out. Wrap around covered porch w/composite decking & maintenance free components. Heat options include LP & an outdoor wood boiler. 24' firepit family area w/pavers. Tons of storage. Finished area above the garage. Seller to retain metal bldg West of home w/approx 2 acres. Seller will consider giving Buyer 1st right of refusal for bldg. Seller will also consider keeping more land w/bldg.